"Save My Face! 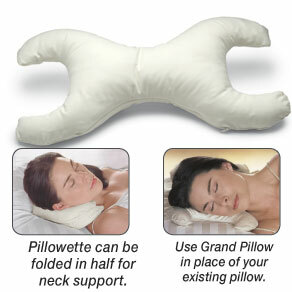 "® La Petite Pillow supports your head, keeping your face and eye tissue away from the sleeping surface. Anti wrinkle pillow prevents face wrinkles, creases and puffiness from becoming permanent. Hypoallergenic and washable. Includes machine washable pillowcase. White. 100% cotton. USA. 19"L x 10"W x 3"H.
Don't waste your money like I did on save your face pillow, it's a great idea, but it doesn't work. The pillow's badly made, and doesn't give enough support, plus the fabric gets worn out and torn quickly. I actually got new wrinkles because of this pillow!! Have past experience and love it!